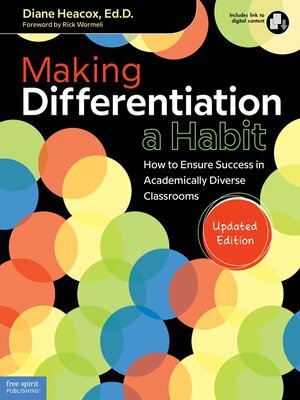 In this updated edition of her guide to daily differentiated instruction, Diane Heacox outlines the critical elements for success in today's class­rooms. She gives educators evidence-based differentiation strategies and user-friendly tools to optimize teaching, learning, and assessment for all students. New features include an expanded section on grading, informa­tion on connections between personalized learning and differentiation, integration of strategies with tier one instructional interventions, scaf­folding strategies, revised planning templates, and updated resources, which include digital tools and apps for assessment. Digital content includes customizable forms from the book. A free downloadable PLC/Book Study Guide is available at freespirit.com/PLC.